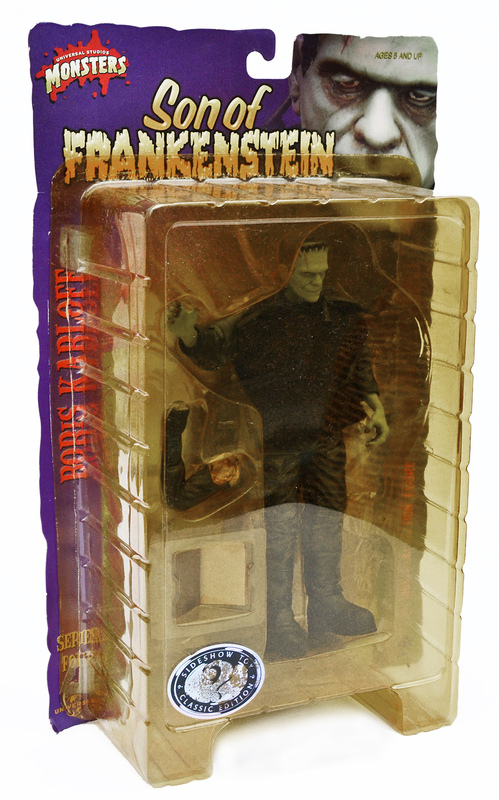 Universal Studios Monsters: Son of Frankenstein action figure by Sideshow Toy (2000) | 'TAIN'T THE MEAT… IT'S THE HUMANITY! Universal Studios Monsters was a collection of 15 posable action figures released by Sideshow Toy between 1999 and 2001. The figures in the collection featured some of Universal Studios’ most iconic movie monsters from the 1930s, ’40s and ’50s. This week it’s the turn of Boris Karloff‘s creature from Son of Frankenstein, released by Universal in 1939. Son of Frankenstein was Universal’s third movie to feature Mary Shelley’s most famous creation, and would be the last to star Karloff as the monster on film. The movie tells the tale of Baron Wolf von Frankenstein, the original Frankenstein‘s son, who along with his family returns to the ancestral castle in an attempt to restore his father’s reputation. However things quickly go awry when the Baron discovers that not only is the creature still alive, it’s now under the influence of the twisted Ygor, who has been using the monster to murder the jurors who ordered his hanging. The film ends with the Baron knocking the creature into a pit of burning sulphur before leaving the town for good, much to the relief of the locals. Directed by Hollywood veteran Rowland V. Lee, the film is extremely effective, thanks in no small part the obvious influence of German expressionist cinema. Lee fills the screen with jagged angles, deep shadows, and wonderfully twisted staircases and door-frames. Basil Rathbone is excellent as the eponymous Baron, and although Karloff doesn’t have a great deal to do in the film, he’s still able to show why his depiction of the monster is definitive. Lionel Atwill is memorable as the sympathetic, yet suspicious, one-armed Inspector Krogh; but its Bela Lugosi’s wonderfully malevolent Ygor who all but steals the film. (So memorable is Lugosi that he too would receive the Sideshow Toy action figure treatment in Series Five of this collection). The film was a great success for Universal and helped not only to revive the struggling studio, but also to usher in a new wave of horror monster movies in the 1940’s and ’50s. 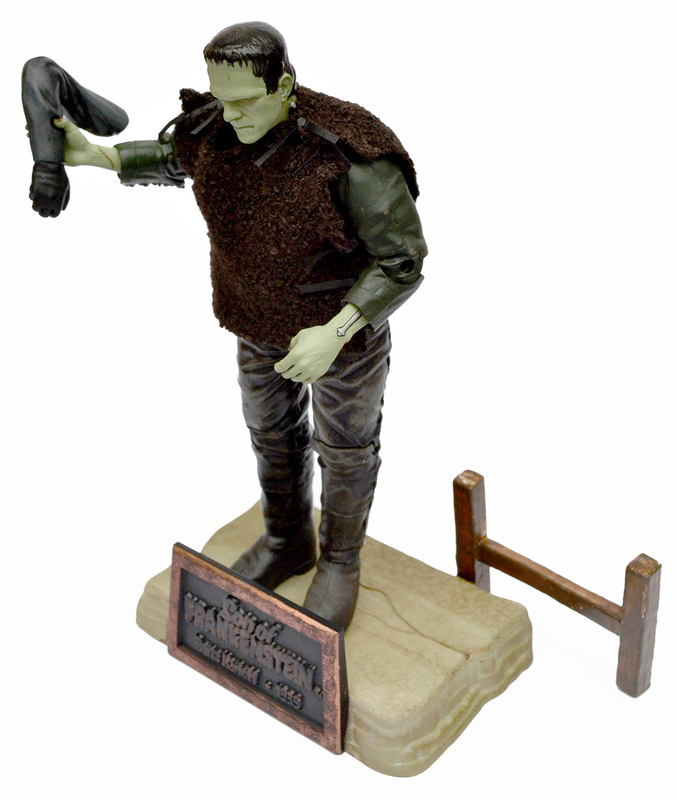 Universal Studios Monsters Son of Frankenstein action figure was released by Sideshow Toy in 2000, and was part of Series Four of the collection. The figure measured nine inches in height (when standing on its base), boasted 12 points of articulation, and shipped in a cardboard-backed blister pack, the back of which featured a short biography of the film and showcased the other action figures available at that time. The figure came with three accessories: Krogh’s prothetic arm which the monster brandishes in its hand; a copy of the first Baron’s journal and the woollen jerkin that Karloff wore in the film. 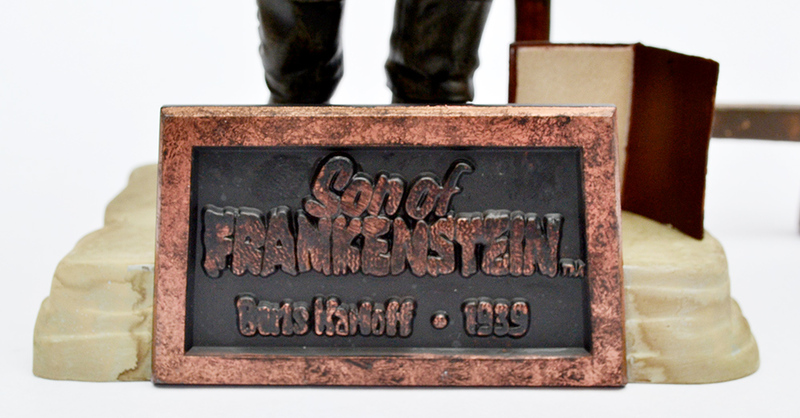 The figure also shipped with a base that featured a nameplate bearing the film’s legend. 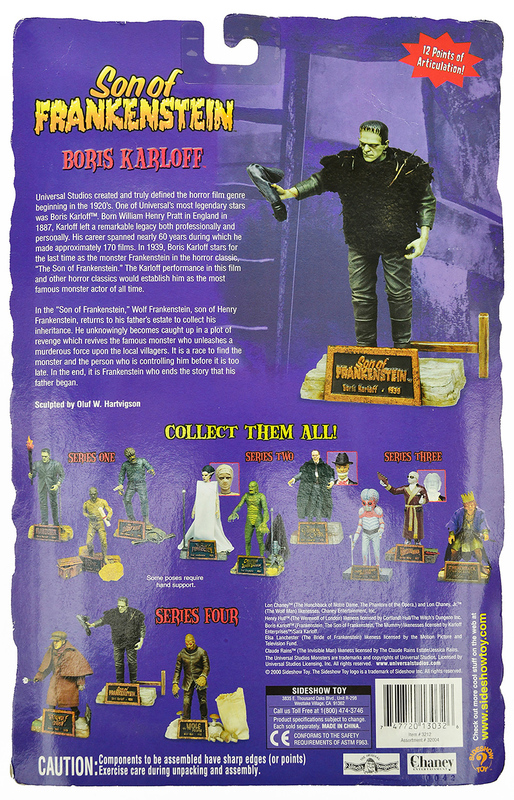 Son of Frankenstein was the third action figure from the Sideshow Toy collection to feature Boris Karloff — his portrayals from Frankenstein and The Mummy featured in Series One. The base and nameplate featuring the film’s logo. 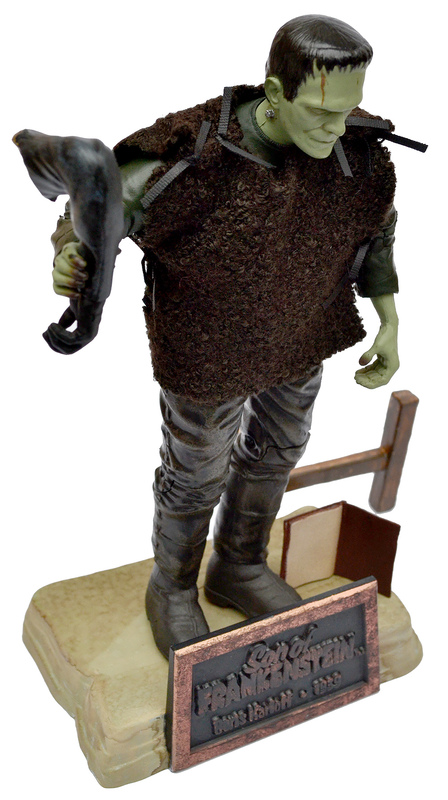 This Son of Frankenstein action figure is based on a sculpt by Oluf W. Hartvigson, who designed the majority of the action figures in the Sideshow Toy collection. Hartvigson did a great job on this action figure, and on the whole it’s an accurate likeness of the monster from the film. The scars on the creatures face are recreated faithfully and there’s some nice detailing on the body (the stitching on his trousers, for example). The inclusion of Krogh’s arm is a nice touch, as is the woollen jerkin. The paintwork is also of a high quality, especially on the creatures britches which feature realistic leather effects. 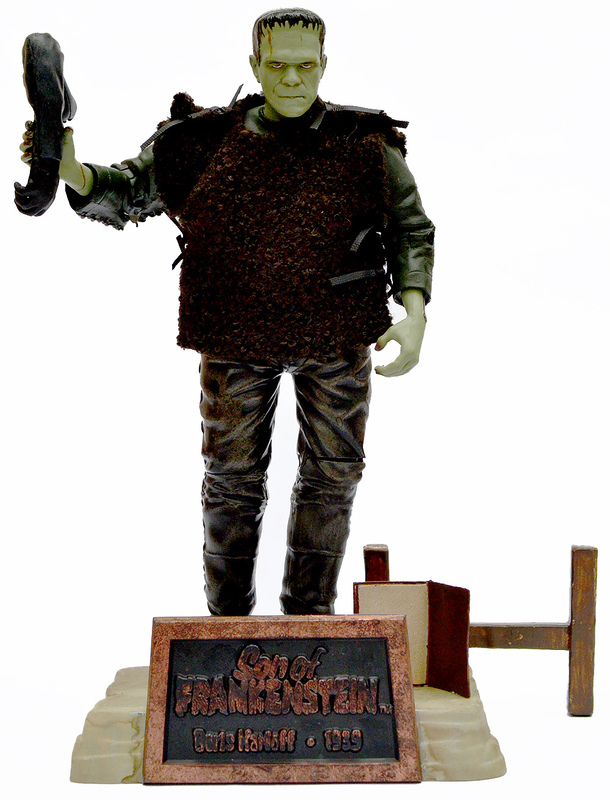 Since its release in 2000 Son the Frankenstein has proved to be one of the most popular action figures from Sideshow Toy’s collection, and new copies can be somewhat elusive. BNIB copies rarely come up for sale on ebay and Amazon Marketplace, and when they do they easily sell for well over £50/$70. Sideshow Toy did release a black and white version of the figure (labelled as the ‘Silver Screen’ edition) but they are also rare and difficult to track down. Die-hard fans of the film may want to persevere however as it’s a great action figure and a welcome addition to any collection. Son of Frankenstein, from all sides. Next: Lon Chaney’s iconic portrayal of The Phantom of The Opera.